My friend Fernando showed me his collection of old Apple dongles that no longer work with the latest generation of Apple devices. This coupled with the announcement of the Macbook pro that promises way more dongles and mostly the same computing, had me freaking out about my computing platform for the future. I’ve been using cloudy tools for more and more of what I do and so it had me wondering if it was time to go back and try my Chromebook experiment again. Basically the question is whether I can do everything I need to do comfortably on a Chromebook. 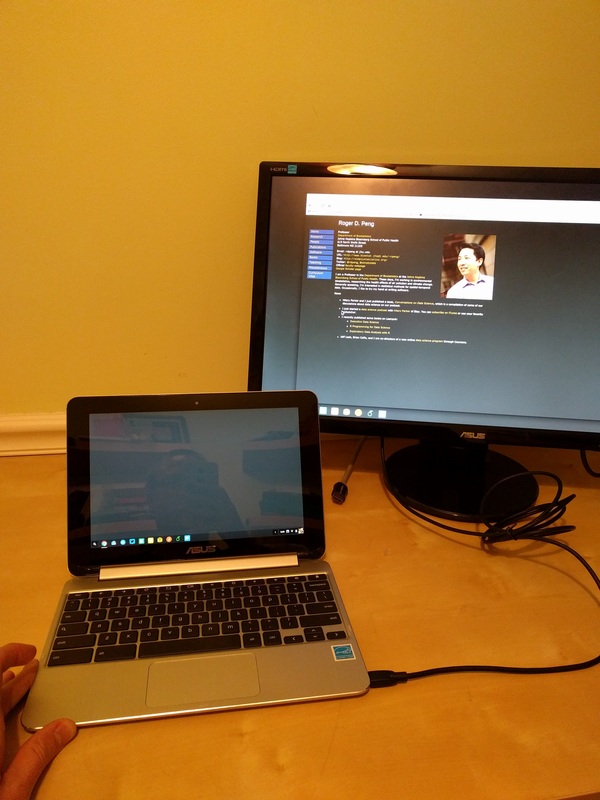 So to execute the experience I got a brand new ASUS chromebook flip and the connector I need to plug it into hdmi monitors (there is no escaping at least one dongle I guess :(). Here is what that badboy looks like in my home office with Apple superfanboy Roger on the screen. R programming on an Amazon AMI with Rstudio loaded although I hear there may be other options that are good there that I should try. That handles the vast majority of my workload so far (its only been a day :)). But I would welcome suggestions and I’ll report back when either I give up or if things are still going strong in a little while…. Not So Standard Deviations Episode 25 - How Exactly Do You Pronounce SQL?